Me as a baby, only 14 days old. So cute! 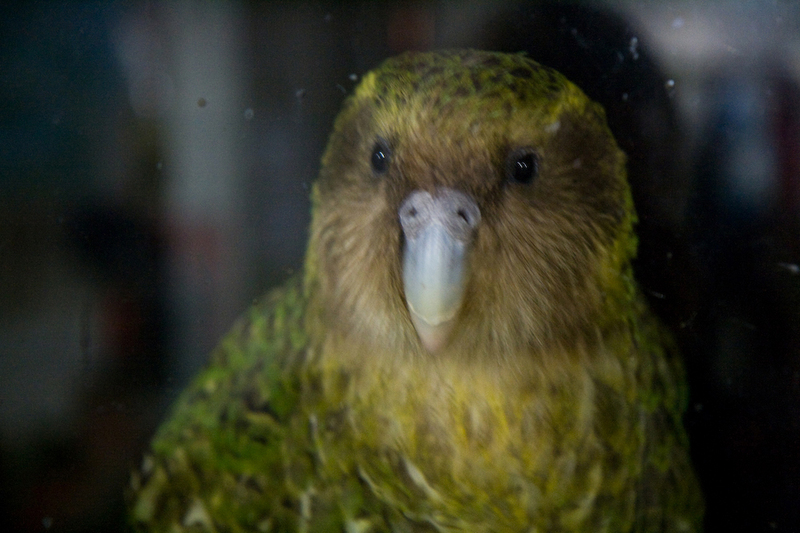 Position: Official Spokesbird for conservation, and one of 129 kakapo left in the world. Officially, I’m the Conservation Spokesbird, and occasionally I get out and about to promote conservation (and myself) in New Zealand. I Facebook and tweet about conservation-oriented stuff and try to get the message out about our threatened flora and fauna and their habitats. Other than that, I’m just your average kakapo stooging around in the bush! The travel? Nah, the people. People might think that it’s them seeing me when I am at places like Orokonui and Zealandia, but actually it’s the other way round! I find it fascinating to see all these different shaped bipeds peering through the glass! The travel! No one should be put in a pet crate for any amount of time! The indignity! Why can’t I sit in a seat? I was hatched into it! Literally. I had health issues when I was a chick and was hand raised by my surrogate mum Daryl Eason (he’s awesome, you should do a piece on him) and the rest is history. The macadamia nuts? Wrong answer! Getting back out into the public eye. I enjoy the solitary ways of my normal parrot life but it’s nice to get out and about and spread the conservation message. The nuts are a bonus too. Haggis the takahē, but she ran off with one of them takahē blokes. Woe is me! One of my portfolio shots. Who's a pretty boy then? An empty food hopper that should be full. Blue penguins invading my track and bowl. Lately I have really been enjoying the juicy bits of the renga renga lily, but I will eat most things green and planty. Macadamia nuts when I can get them. Whenua Hou/Codfish Island, it’s my place of hatching. Particularly Norwest Bay, my old hood. Te Hoiere/Maud Island, it’s my current home and has a nice climate, plus Haggis the takahē lives there. Rakiura/Stewart Island, it’s my ancestral home (where mum and dad came from) and it’s a beautiful part of New Zealand. Movie: I’m not really big on movies, I only get to see them from outside the hut (why is that! ), but I do like David Attenborough’s Life of Birds series. I’m a bird and I am still amazed by the things birds can do! Album: It’s not an album but I really like the dawn chorus on Maud Island. It’s like my reverse alarm clock telling me to go to bed! 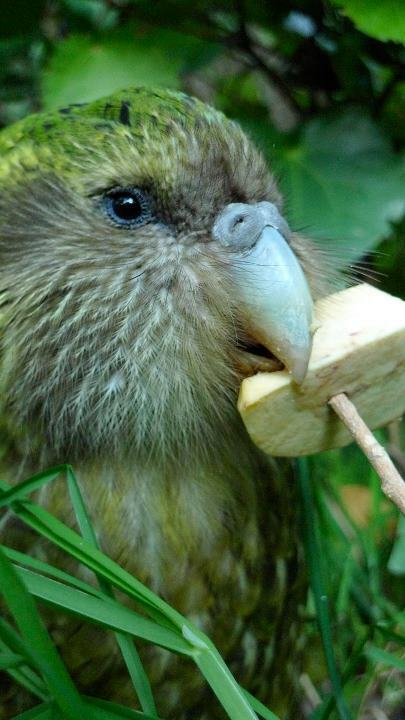 Book: Alison Ballance’s recent book, Kakapo. 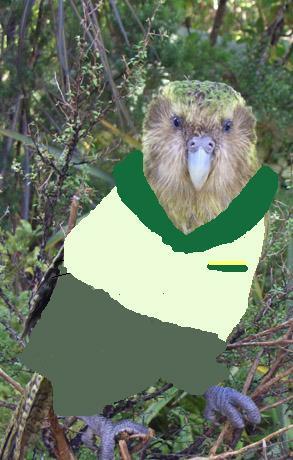 It’s about as up to date on kakapo as you can get and, obviously, it has me in it. What piece of advice would you tell your two year old self? All the people who give their time to conservation. I’ve seen a lot of volunteers and rangers in my time (some even have the scars to prove it!) and it’s amazing how much hard work and love they bring to the cause. It is truly inspiring to see such dedication and it makes me feel all warm to know they have got my best interests at heart, as well as those of all the other critters and plants. A DOC ranger, they seem to have all the fun. And now, well, I kind of am one aren’t I? ‘Ranger Sirocco’ … Sounds good to me. Where’s my uniform? I quite liked the look of that cockpit on my flight down to Dunedin, all those buttons and lights, maybe a pilot! If you could be any other New Zealand native species for a day, what would you be and why? One that can fly! Perhaps a karearea/New Zealand falcon, they look pretty neat and boy can they fly! Is there a pattern forming here? I’m perfectly fine with walking most of the time, but, you know, well, flying looks like so much fun! So true. People! We need to value and protect all of our native species and their habitats, not just the super awesome handsome ones like me. So get out there and get stuck in kiwis. We all need your help. Get involved! Plant a tree, run a pest trap line or give your time as a volunteer to a conservation project, and if you’re passionate like I am, tell anyone who will listen. And if they won’t listen, tell ‘em anyway! For lucky Animal Health Board (AHB) staff members, District Disease Control Manager Jane Sinclair and Finance Manager Joy Tracey, the adventure of travelling to a secluded island surrounded by native birds became a reality when they won a trip to Whenua Hou/Codfish Island. 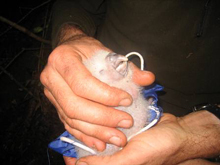 The purpose of the two week excursion to Codfish Island was to volunteer with the Kakapo Recovery programme. My adventure began when I first put my hand up at the AHB’s Christmas function auction. A few nervous minutes later and I was the proud winner of a two week stint on the kakapo sanctuary at Codfish Island. To prepare, I spent the next few Sunday mornings carrying my pack up Kakepuku—a 400-metre volcanic cone near Te Awamutu—and eating my breakfast at the top. It was hot, sticky work which ultimately proved to be worthwhile. I arrived at the Department of Conservation quarantine office in Invercargill, where all my possessions were carefully inspected for seeds, dirt and mice. We were then put in an impossibly small plane (with just one pilot and three passengers) on our way to Codfish Island. 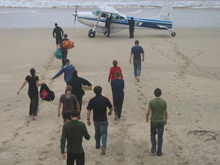 We touched down at the landing on the beach at Sealers Bay. On our arrival, there was a mad scramble to off-load our gear as another group was ready to disembark the island. We were given an induction on what our roles would entail and the following day we each headed out with a map to tackle the feed-out run. Here’s where my Sunday morning training sessions came into effect. Carrying a 13 kilogram pack, it took me seven hours to complete that first day and I was seriously wondering how I would cope for a full two weeks. After a great cup of tea and a good night’s sleep however, I was up and away the next day. I was finished in just under five hours and felt completely elated. 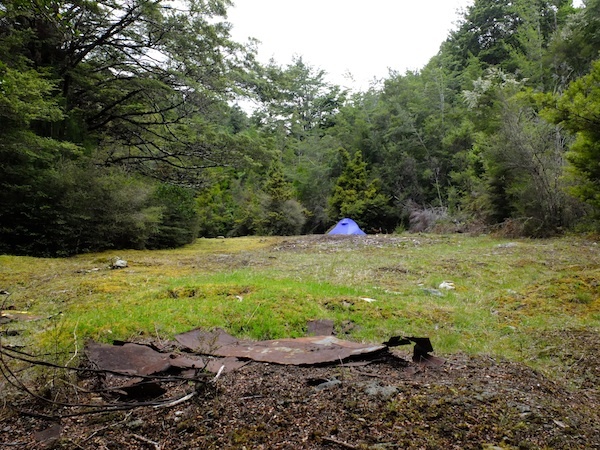 The island’s vegetation is incredibly varied, spanning large forests to knee high scrub at the 500 metre summit. Peat also makes the underfoot conditions soft and, in some places, muddy. Everywhere on the island there were tomtits, tui, kaka, bellbirds, wood pigeons, rifleman and kakariki. Feed-out runs were divided into four different routes, looking after 28 birds in total. We had every third day off. 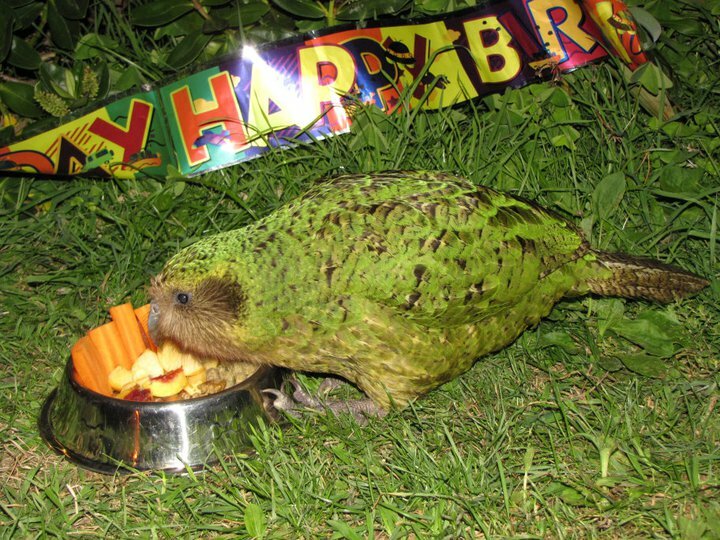 On my first day off, I was asked to help with locating and catching a 2009 born kakapo named Hillary. We headed up to the summit and used telemetry to locate a signal off the North West Hut track. Once we thought the bird was close, it was a case of quietly manoeuvring through head high vegetation until we were on top of it. Once caught, Hillary was weighed, given a thorough health check and released. It was a magical experience to be so close to one of these magnificent birds. 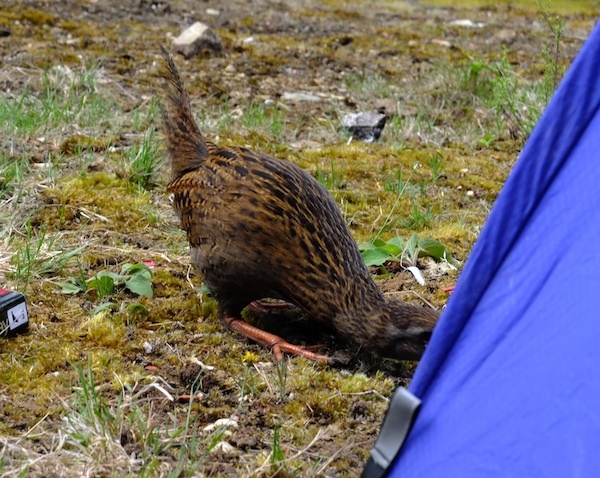 I was then asked if I would like to do some nest minding and spent the next four nights in a two man tent, high up on the island, looking after Flossie’s chick. 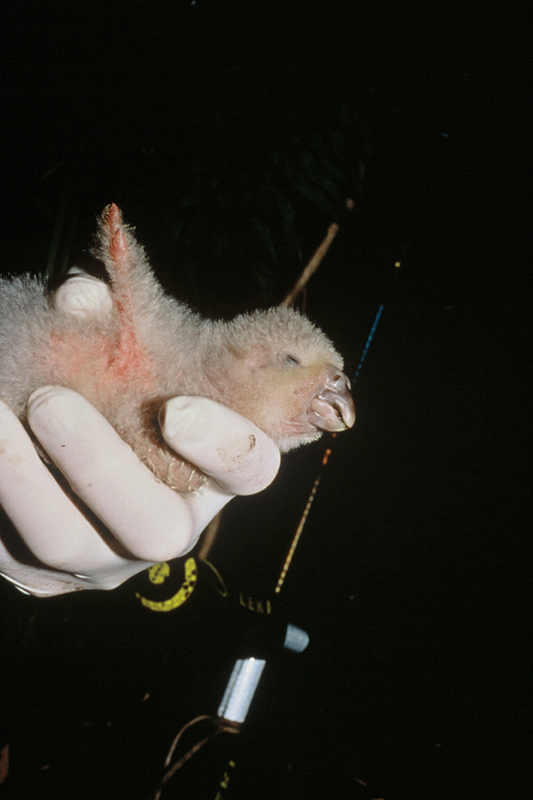 When the chicks weigh less than 500 grams, they are given extra heat at night when the mother leaves the nest. 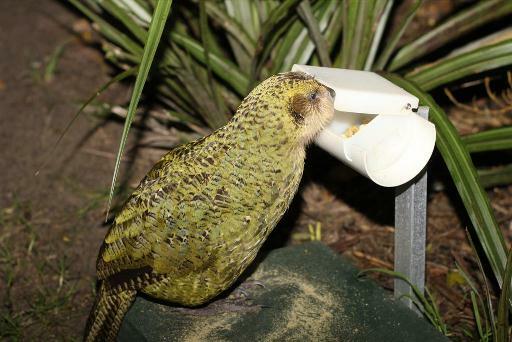 A beam-activated door bell lets you know when the mother kakapo leaves her nest. A small battery powered duvet is then placed over the chick and lifted every 10 minutes to ensure it is okay. 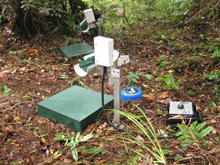 Telemetry is used to indicate when the mother is returning and infra-red recordings of the nest are made and reviewed every 24 hours. The dedication of the rangers was truly inspiring. When they’re on the island it is a 24-hour commitment over the entire month. They would literally run up the hill at any time of the night to check on a chick’s wellbeing. I must say, my two weeks on Codfish Island came to an end all too quickly. I left feeling the fittest I‘ve ever been and encouraged that the kakapo are in such excellent hands. The work being carried out is achieving wonderful results, with 11 chicks that wouldn’t have survived without intervention this year. I have every confidence in the long-term future of this remarkable bird. Written by Jane Sinclair for TB Matters.